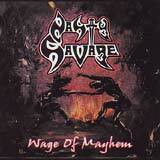 Nasty Savage is a thrash band that hails from Florida, USA having released 4 albums from 1985-1989. The band was known for their brutal live shows that included wrestling holds, smashing TV's, and spewing blood. It all came to an end in 1990 when the all too familiar "personal conflicts" overcame the band and led to its breakup. In 1999, Crook'd Records re-issued the band's 1989 release (their last album), Penetration Point. Wage of Mayhem is also being released by Crook'd Records as a prelude to the band's forthcoming full length studio album due out later this year. Wage of Mayhem is the 4 track demo from 1984 which resulted in the band's deal with Metal Blade in 1985. After nineteen years, fans of the band will be able to hear Nasty Savage in their very early stages. This release of the band's 1984 four track demo includes 2 newly recorded songs, Sardonic Mosiac and Wage of Mayhem (part one). The band is as heavy as ever, and they sound even more aggressive now than they did in the past. Nasty Savage still offers a heavy dose of thrash riffs and flamboyant solos backed by thunderous double bass drumming. Somehow, I am reminded a bit of Laaz Rockit at their heaviest while I listen to these new tracks. Although thirteen years has passed since the last Nasty Savage recordings, the band has not lost any of its inspiration or heaviness. Vocalist Ronnie Galetti's (who always wanted to be a pro Wrestler) voice seems not to have aged either as he sounds nearly the same as it does on the 1984 tracks. I can't say that the new songs are ground breaking or mind blowing, but fans of the band and fans of old school thrash metal will find a lot to like here. As for the 1984 demo tracks, they are exactly what you would expect from the band: aggressive, in your face thrash metal. I do hear a distinct NWOBHM influence in these early tracks. Specifically, the early and energetic (pre Atlantic Records) days of Raven jump out at me. The sounds of these 4 tracks capture the youthful hunger and dedication to aggressive music that got the band a deal with Metal Blade. The song structures are quite unrefined and the sound is quite raw, but that is natural for a band's first demo recording. Wage of Mayhem will be a two fold treat for their fans: they will finally be able to hear the band's first recordings and they will hear that Nasty Savage of 2003 is just as "nasty" as they were in 1984. If these two new tracks are any indication, the forthcoming LP of Nasty Savage will be getting a lot of attention from fans of very loud, old school thrash metal.